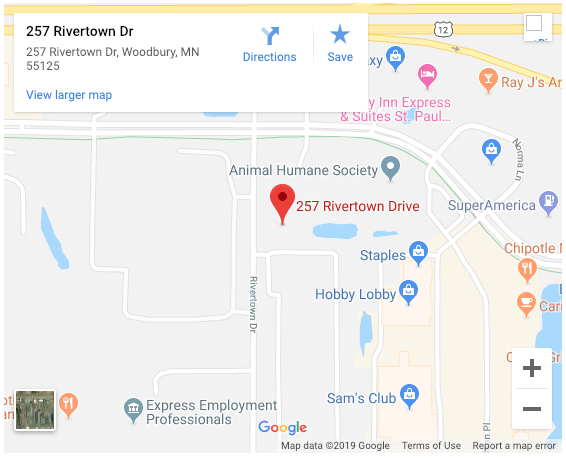 UpLift Guided Fitness is located in Woodbury, Minnesota, upstairs in the Perpetual Motion building, at 257 Rivertown Drive. Take I-94 East, get off at Woodbury Drive, Exit 251. Go south 1/4 mile on Woodbury Drive, then take a right on Hudson Road. You are now headed west. Go 1/2 mile to Rivertown Drive. Take a left on Rivertown and we are 1/4 mile down on the left, upstairs in the Perpetual Motion building. Take I-694 East/South to where it meets I-94. Take I-94 East, get off at Woodbury Drive, Exit 251. Go south 1/4 mile on Woodbury Drive, then take a right on Hudson Road. You are now headed west. Go 1/2 mile to Rivertown Drive. Take a left on Rivertown and we are 1/4 mile down on the left, upstairs in the Perpetual Motion building. Take I-494 East/North to where it meets I-94. Take I-94 East, get off at Woodbury Drive, Exit 251. Go south 1/4 mile on Woodbury Drive, then take a right on Hudson Road. You are now headed west. Go 1/2 mile to Rivertown Drive. Take a left on Rivertown and we are 1/4 mile down on the left, upstairs in the Perpetual Motion building. Take I-94 West (toward the Twin Cities). Take Exit 251, Woodbury Drive, and proceed south 1/4 mile to Hudson Road. Take a right on Hudson Road. You are now headed west. Go 1/2 mile to Rivertown Drive. Take a left on Rivertown and we are 1/4 mile down on the left, upstairs in the Perpetual Motion building.